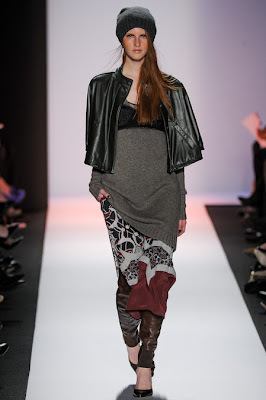 With New York Fashion Week underway, all eyes were trained on the BCBG Max Azria presentation for key indicators of casting trends for the Fall/Winter 2013 season. An opening or closing slot in BCBG's presentation generates a deluge of interest which translates to blue chip appeal as the show season unfolds. Last season, French newcomer Marine Deleeuw, cashed in on her opening slot at BCBG with a staggering 47 show tally by the close of the collections. 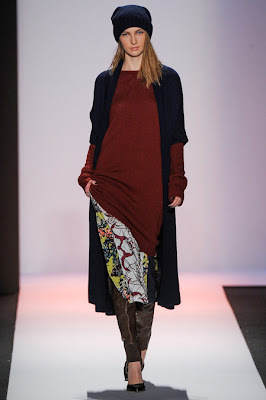 Casting director Jess Hallett outlined BCBG's aesthetic for this season, "We're looking for girls who have a strong walk, who are confident and can carry themselves very well, but aren't too young. With this collection we're looking more for tomboys, someone who is kind of edgy with a little street style element to them." And so as the lights dimmed, BCBG's new model army converged on the runway led by newcomers Nikola Romanova, Aleksandra Zieminska, Margita Zuchova, Meng Huang and closing with Serbian stunner Mila Mihaljcic. In between were a flurry of last season's most coveted faces including Kayley Chabot, Nastya Kusakina, Chiharu Okunugi, Esther Heesch, Elena Bartels, Manon Le Loup, Magdalena Jasek, Grace Mahary, and Pauline Hoarau. Of the eclectic and ethnically diverse show line-up, Hallett enthused "Each girl has to have their own identity and brings something to the table, but you also need to think of it as a whole. It's not just individuals, you have to think does that girls work with the other girls? There has to be a kind of thought throughout the whole process because while you are looking for individuals, you have to think of it in terms of the bigger picture."